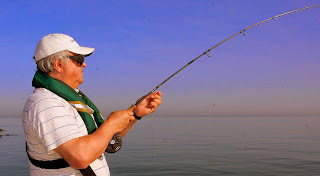 “Below is a list of five of my favorite local freshwater fishing spots. ”Our criteria for inclusion was that an area be within a half-hour drive from Bridgeport, have nearby parking and fish, of course. “I quit fly-fishing about the same time as I quit riding motorcycles — when I was in my late 40s. I ceased the motorcycle riding because I began to feel my mortality, thinking I might end up crippled up in an accident…. Photograph is not related to this story. That's Val S. in the photo, and he has not quit fly fishing. “Striped bass is my favorite fish, and this preparation is quick & easy, especially when time is a premium. ”The striped bass is seared skin-down, then poached in the olive oil to create a fillet that is moist & delicious. ”The tomato salsa, made with minced red onion & garlic, adds just the right amount of acid.